Gorham Police K-9 Officer Nate Therriault, left, commands K-9 Sitka to grab a “bad guy” played by Officer Todd Gagnon wearing a protective suit. 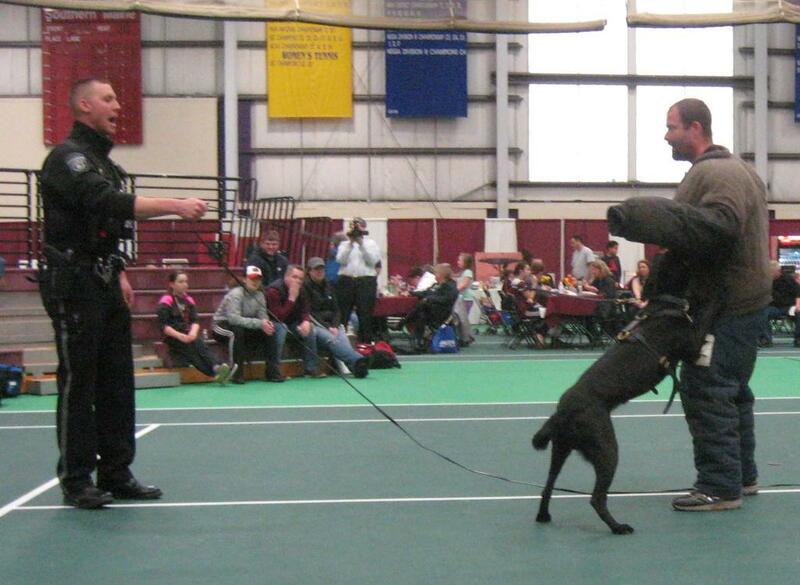 Sitka showed his stuff Saturday at the annual Marketplace held at the University of Southern Maine. Maine author James Hornor will present his new novel, “Victoria Falls,” at 7 p.m. on Thursday, April 11, at North Gorham Public Library, 2 Standish Neck Road. Copies of the book will be available for sale and signing. According to the library, “Victoria Falls” is a mid-life coming of age novel about a man on a mission in Africa for the World Bank. “In its exploration of American male stereotypes and in its suggestion of vulnerability as a key to masculine authenticity, ‘Victoria Falls’ dares to embrace those humane qualities of love, kindness and creativity that have of late been extolled as the provenance of soul-searching women but have been largely ignored in American fiction about men,” the library said. Hornor is an educator, writer and speaker who lives with his wife and two children in Brunswick. He and his wife, Eileen, own The Brunswick Inn. A published poet, Hornor teaches English composition at Southern Maine Community College and works in the college Writing Center helping students to realize their full potential as aspiring writers. For more information, visit libng@north-gorham.lib.me.us or contact Jennifer Plummer, library coordinator, at 892-2575. The Gorham High School Building Committee will meet at 6 p.m. April 11, in the second-floor conference room at Gorham Municipal Center, 75 South St. The Bureau of the Fiscal Service reported on March 28 that the U.S. public debt was $22,029,112,480,741.88.